We left this adventure at the Cafe in the Crypt. After a fantastic lunch and a chance to cool off, we headed back out onto the streets of London for further exploration. Rowena is a theatre major and she wanted to walk through the theatre district. 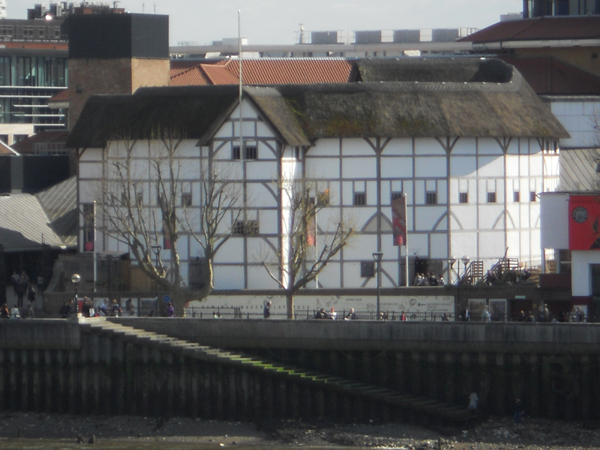 More than that, she wanted to see the Globe, a modern reconstruction of the theatre in which Shakespeare’s plays were performed. Armed with maps in our smart phones, we set off. Though my husband and I have visited London several times, these explorations took us to a part of the city we hadn’t visited before. 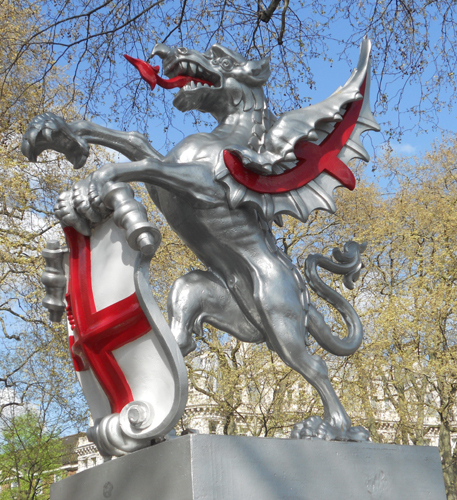 We crossed into the original city of London, the boarders of which are still marked by beautiful dragon statues. London is an amazing city. It doesn’t take long to see why it’s such a cultural center, why people come from all over to see the sights. Every couple minutes you pass something to take a picture of. 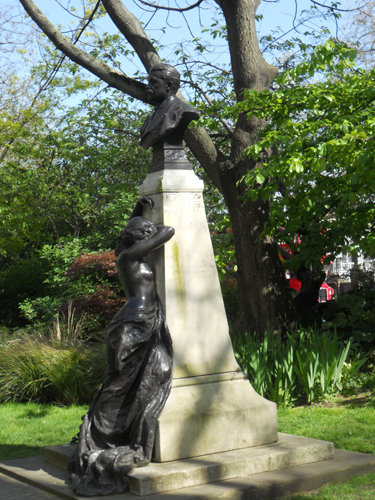 My favourite was this statue dedicated to Arthur Sullivan, an English composer, which features a weeping muse. We walked along the river until we located the Globe. Rowena wanted to approach from the bridge so that we could get pictures of the theatre from afar. To get there, we crossed London’s Millennium Bridge, which is an impressive steel suspension bridge built for pedestrians. 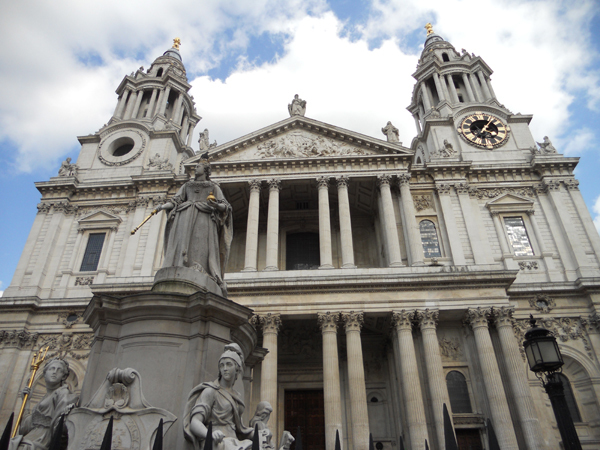 While Rowena and her husband toured the Globe, the rest of us filed back across the bridge to explore Saint Paul’s Cathedral. The architecture of this building is stunning, to say the least. I would have loved to go inside, but it’s expensive. The current cathedral is built atop the ruins of a medieval chapter house and cathedral which burned during the London fire in 1666. We spent a lot of time walking around the exterior, snapping photos of the decoration. We reunited with the rest of our group after the Globe tour and decided to look for an early dinner, before all the pubs filled up. The hubby and I had encountered a place called the Maple Leaf once before, and we called ahead to see if we could reserve a table. On the way, we saw some interesting things on the bank of the Thames. First we saw a camera crew positioning a toilet near the water’s edge. We’ve no idea what was going on there. A little further up the bank we encountered these guys. 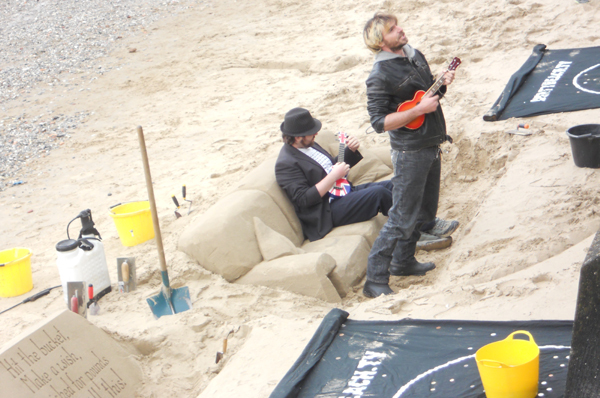 I thought the sand couch was a nice touch. We tried to get some money in the bucket but, alas, it bounced out. 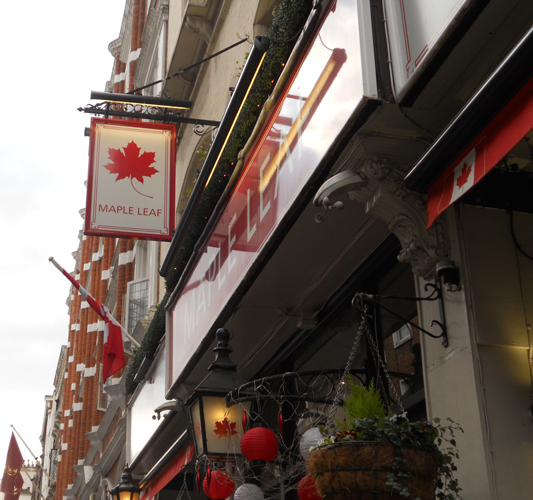 After a hearty laugh, we continued on to our destination, a small piece of Canada in the heart of London. Dinner was fabulous, even if the poutine wasn’t as good as we hoped. It was nice to talk to some fellow Canadians who also came to the UK in search of work. Tired, but satisfied, we returned to the train for the trip home.